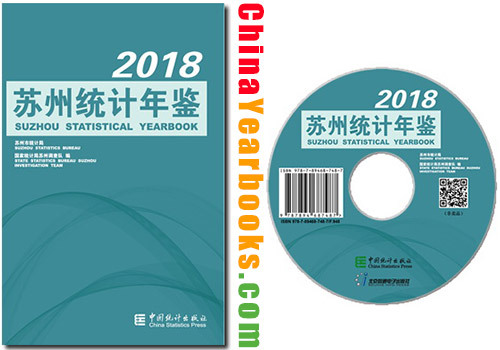 Ⅰ.Suzhou Statistical Yearbook 2018 is a publication which provides comprehensive and systematic data covering the economic and social development in Suzhou Municipality in 2017. Ⅱ.This yearbook is comprised of 22 parts including Achievement Graphs and Charts, General Survey, Population and Labor Force, Agriculture, Industry, Construction, Transportation, Post and Telecommunication, Wholesale, Retail Sales and Catering Business, Export-Oriented Economy and International Tourism, Services, Consumption of Energy, Investment in Fixed Assets, Enterprises Survey, Finance, Banking and Insurance, Price Indices, People’s Livelihood, Science and Technology, Education and Culture, Public Health and Sports, Civil Administration, Judiciary and Other Items, Urban Construction and Environmental Protection, Cities Compare. Ⅲ. The statistics in the yearbook are mainly the statistics in 2017, and the main indicators also list the statistical data in the key years since the founding of the People’s Republic of China. The data mainly comes from the periodic statistical reports and sample survey data of Suzhou Municipal Bureau of Statistics and Suzhou Investigation Team of National Bureau of Statistics, and some of the information comes from administrative departments of Suzhou municipal government. Ⅳ. According to the changes of the national statistical system, some historical data is adjusted accordingly, and in the use of historical data, when the data in previous yearbooks is different from that in this yearbook, the data in this yearbook is to be used. Ⅴ. In September, 2012 Wujiang City was changed into Wujiang District, and the original Changlang District、Pingjiang Dictrict and Jinchang District were merged to become Gusu District. The whole city’s data in the yearbook includes the data of Gusu District, Wuzhong District, Xiangcheng District, Huqiu District、 Suzhou New District, Suzhou Industrial Park, Wujiang District, Changshu City, Zhangjiagang City, Kunshan City and Taicang city, and the data of the central city includes that of Wujiang District (except the data of meteorology, hydrology and price). “ # ” indicates the component items. Here we’d like to express our sincere thanks to the readers who have provided us so many invaluable suggestions on content selection and compilation of the yearbook. Our thanks also go to those friends in all circles of society who have shown their support and care to the publication of the yearbook. We welcome any suggestions and comments from readers at large so as to help us to further improve our work of compilation. 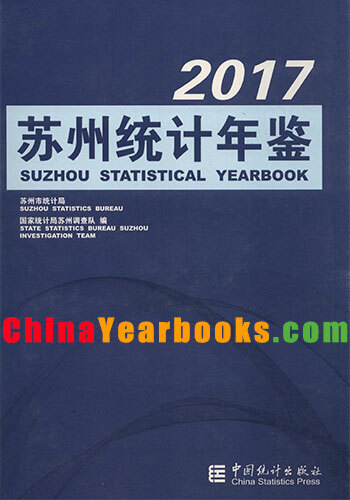 Ⅰ.Suzhou Statistical Yearbook 2017 is a publication which provides comprehensive and sys-tematic data covering the economic and social development in Suzhou Municipality in 2016. Ⅱ.This yearbook is comprised of 22 parts including Achievement Graphs and Charts,GeneralSurvey,Population and Labor Force,Agriculture,Industry,Construction,Transportation,Post andTelecommunication,Wholesale,Retail Sales and Catering Business,Export-Oriented Economy andInternational Tourism,Services,Consumption of Energy,Investment in Fixed Assets,EnterprisesSurvey,Finance,Banking and Insurance,Price Indices,People’s Livelihood,Science and Technolo-gy,Education and Culture,Public Health and Sports,Civil Administration,Judiciary and OtherItems,Urban Construction and Environmental Protection,Cities Compare. 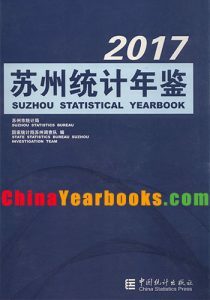 Ⅲ.The statistics in the yearbook are mainly the statistics in 2016,and the main indicators alsolist the statistical data in the key years since the founding of the People’s Republic of China.Thedata mainly comes from the periodic statistical reports and sample survey data of Suzhou MunicipalBureau of Statistics and Suzhou Investigation Team of National Bureau of Statistics,and some ofthe information comes from administrative departments of Suzhou municipal government. Ⅳ.According to the changes of the national statistical system,some historical data is adjustedaccordingly,and in the use of historical data,when the data in previous yearbooks is different fromthat in this yearbook,the data in this yearbook is to be used. Ⅴ.In September,2012 Wujiang City was changed into Wujiang District,and the originalChanglang District,Pingjiang Dictrict and Jinchang District were merged to become Gusu District.The whole city’s data in the yearbook includes the data of Gusu District,Wuzhong District,Xiang-cheng District,Huqiu District、Suzhou New District,Suzhou Industrial Park,Wujiang District,Changshu City,Zhangjiagang City,Kunshan City and Taicang city,and the data of the central cityincludes that of Wujiang District(except the data of meteorology,hydrology and price). Ⅵ.Explanations on symbols used in this yearbook: “…” indicates that the data are not large enough to be rounded into the minimal unit, “space” indicates that the data is unknown and indicates the data not available, “-” indicates the data not available, “#”indicates the component items. Here we’d like to express our sincere thanks to the readers who have provided us so many in-valuable suggestions on content selection and compilation of the yearbook.Our thanks also go tothose friends in all circles of society who have shown their support and care to the publication ofthe yearbook.We welcome any suggestions and comments from readers at large so as to help us tofurther improve our work of compilation.